Whether you play it un-amplified as a meditative cure to life's pressures or push the boundaries with cutting-edge FX treatments, either on its own or as part of your set-up, the Garrahand will challenge preconceptions whilst being superb fun too. Innovative, great sounding and very fun. XLR and jack connectors offer vast amplified possibilities. A bit of a novelty instrument that won't be for everyone. Possibly one of the most intriguing instruments ever to arrive at our office, the Garrahand, is the brain-child of two Argentinian musicians who met whilst studying at a music conservatory. Federico Parra and Ary Lacanna designed the first Garrahand as a gift to the famous Argentinian percussionist Mariano Cantero, and the latest version of this fascinating instrument is now available to buy. The Garrahand is a highly versatile and extremely durable chromium steel-shelled hand drum that, whilst in a similar ballpark to the 'Hang Drum' from Switzerland or the 'Hapi' from the USA, has several important differences. Its connectivity via both jack and balanced XLR outputs means that its amplified sonic possibilities are endless. The upper playing surface features seven tunable 'tongues' which each have a tuning range of three-and-a-half tones and when amplified it has a melodic range of over two octaves. In addition to the two side-mounted output sockets is a volume control pot and a mounting socket which allows you to position the Garrahand (via a cymbal stand) anywhere within your kit or percussion set up. The dimensions are much smaller than, say, the Hang Drum, making it highly portable - and if you wish you can play a pair of Garrahands for double the fun! The review model came in an attractive metallic fleck-painted finish but there will also be funky colour finishes available in the not too distant future! Played with the pads of the fingers the sounds are subtle but beautifully rich and full of tone and, through a PA, nothing short of sublime. We had great results using various weights of felt beater and, although drumsticks would not be a great idea, the beaters posed no threat to this resilient creation. Further revelations resulted from plugging different effects pedals into the Garrahand, and using a sampling digital delay to create a 'drone' to play over was huge fun. The Garrahand can be opened up and inside features 'direct box' circuitry with its round mic actually eliminating all extraneous sounds. 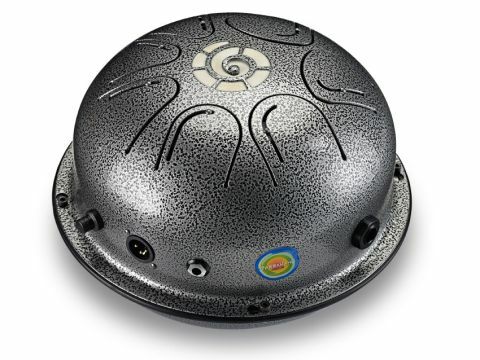 The resonator at the bottom adds further sustain and can sound great when played - as can the top 'G-Spiral', behind which sits an adjustable tone-dampener that attains a tabla-esque tone when amplified. An instrument of this complexity is only really limited by one's imagination, but the technique required to play it does not need to be complex. It's a highly intuitive instrument that will no doubt earn itself legions of fans - and with highly respected endorsers all over the world (including Pete Lockett), the Garrahand's reputation is spreading fast.